Since our beginnings as a manufacturer of fiberglass entry steps, Style Crest has led the way in mobile and manufactured housing innovation. Our full line of siding and exterior accessories offer beautiful, low-maintenance, opportunities to extend a home’s style and outdoor charm. 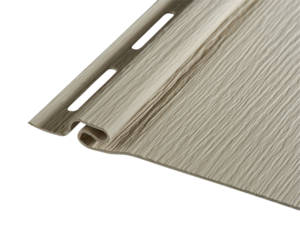 Style Crest, Inc. expands its Titan XTERIOR foundation cover product line with the introduction of Titan XTERIOR Prime, an innovative and durable alternative to traditional vinyl skirting. Titan XTERIOR Prime is designed to withstand the demands of everyday life with the strength to resist damage caused by lawn care accidents, playful children and Mother Nature. 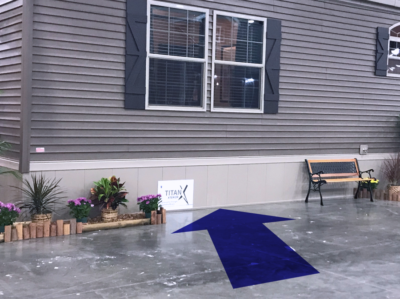 Titan XTERIOR Prime enhances the curb appeal of manufactured homes by offering the realistic appearance of stucco or poured concrete foundations. Titan XTERIOR Prime comes in three color options, white, clay, and dove, to complement any home style. Titan XTERIOR Prime is engineered for strength and designed for beauty—bringing another innovative foundation cover to the manufactured housing industry. Style Crest awarded Supplier of the Year a second year in a row. The award was presented during the 2018 Manufactured Housing Institute Congress & Expo held in Las Vegas, NV. Voted on by the members of MHI, Style Crest was recognized for its innovation of new products along with its continued support and advancement of the manufactured housing industry. This is the seventh time Style Crest has been named MHI Supplier of the Year, previously winning the award in 1996, 1998, 1999, 2014, 2015 and 2017. Style Crest is committed to providing the manufactured housing industry with extensive product offerings and a dedicated service platform that customers count on to support the success of their businesses. Style Crest continues to show leadership in the industry with their complete line of Revolv® heating and cooling solutions and innovative foundation cover products designed specifically for manufactured homes. Style Crest recently introduced Titan Xterior Elite, Mason’s Rock and Mason’s Brick to provide the industry with more aesthetic foundation covers. Mason’s Rock now comes pre-trimmed to save hours of installation time. 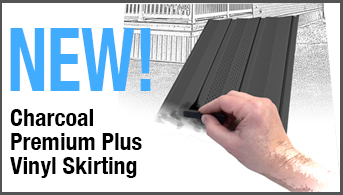 Pre-vented 36″ panels eliminate the need for stocking a vent – saving time and money. On July 31st Style Crest acquired Magic Mobile Home Supply of New Mexico. Magic Mobile Home Supply has been in operation for more than 40 years and has two locations in Albuquerque and Las Cruces, NM. 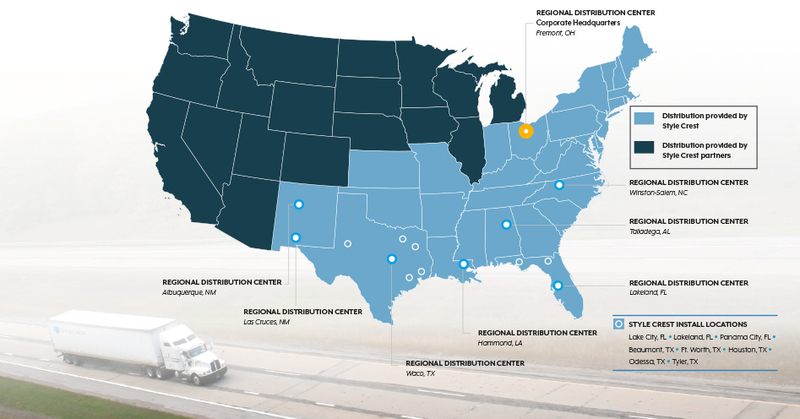 Style Crest is the leader in Manufactured Housing building products distribution and we strive to serve the industry and our customers with the best products, service, delivery, and partnerships. We welcome the Magic Mobile Home Supply team to the Style Crest family. With the combined expertise and experience of our two teams we are the supplier of choice! 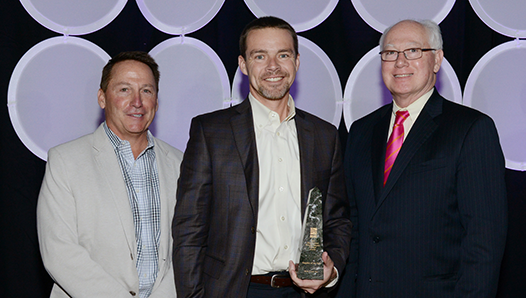 Style Crest named MHI Supplier of the year for a 6th time. Thank you all! 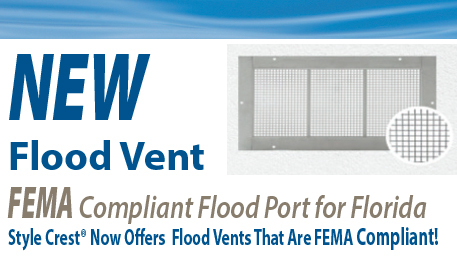 If you are in our Florida market, ask about our new FEMA compliant flood vent. It's Time to Go for the Gold! Your dream of having the best looking home on your street is attainable. 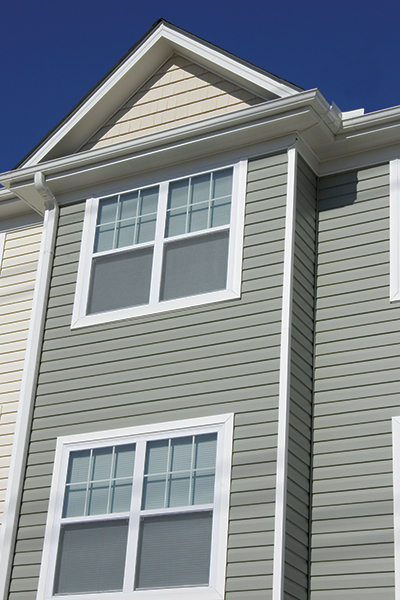 For those who love to stand out, the easy win is Board & Batten Vinyl Siding. 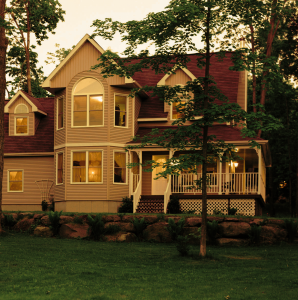 The vertical lines of Board & Batten siding create unique and distinct architectural details. Board & Batten looks spectacular by itself...or as an accent wall, it teams up well with many other exterior cladding products. The Style Crest Sales Center is always happy to answer questions about any of our products or to help you with your order. Style Crest® Sales Representative today! RS8 Cedar Shakes bring a classic look to any home – new or remodeled, but sometimes matching an existing color is challenging. That’s why Style Crest has expanded our NOVIK RS8 program. We’ve grown from 9 matching colors to 23, so you can offer RS8 Cedar Shakes in 23 color matching options. 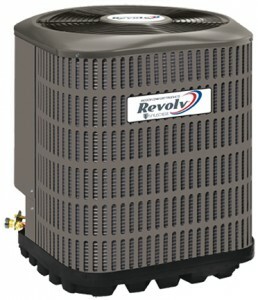 Fremont, Ohio - Style Crest recently introduced its next generation line of Revolv® HVAC products specifically designed for the Mobile Home Channel. According to Bill Vogel, Executive Vice President, Style Crest, "The next generation of Revolv products feature new and industry leading features and technology. This next generation of products also meets all of the current Federal standards, and is supported by the best warranty in the channel." Style Crest partnered with Nortek® Global HVAC in the design and engineering of the new line of products. 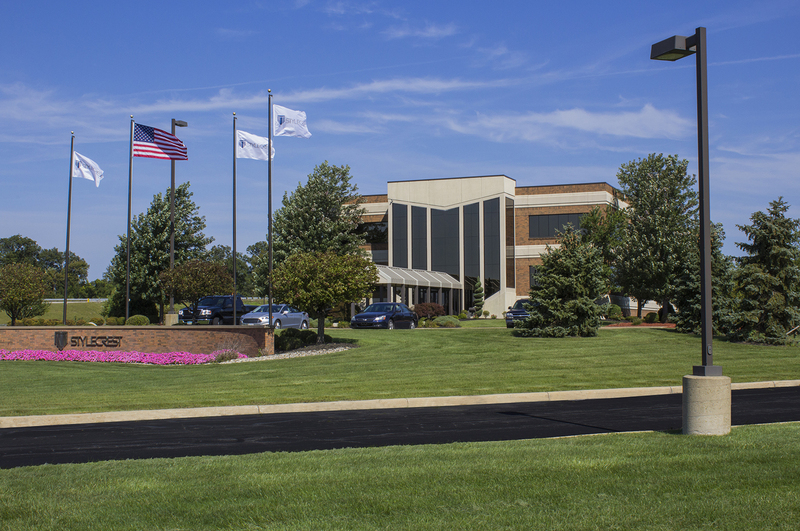 Nortek has over 50 years of engineering, design, and manufacturing capabilities in providing HVAC products for the manufactured housing industry, while Style Crest has served the MH channel with HVAC products and other building materials for the channel for over 40 years. The strategic partnership will allow the Revolv brand to continue to lead the industry in the development of state of the art products for the mobile home channel. Style Crest, Inc. is a manufacturer, distributor of over 4,000 products and installer, servicing the manufactured housing industry nationally for over 40 years. 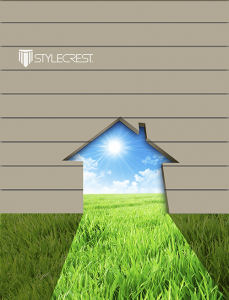 Style Crest has a profound understanding of the needs of its customers. 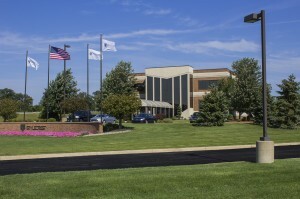 Their approach is based on quality products and meaningful customer relationships. To learn more about Style Crest, visit, www.stylecrestinc.com, or call 800.925.4440. Nortek is a global, diversified industrial company whose many market-leading brands deliver broad capabilities and a wide array of innovative, technology-driven products and solutions for lifestyle improvement at home and at work. The company’s broad array of offerings includes ventilation products such as range hoods and bathroom fans, security and audio/video solutions, heating and cooling products, air management systems, and ergonomic and productivity solutions. CrestWater® Cedar Shake's have a deep textured appearance of wood that looks like it has been hand-split by an axe, yet is formulated with an acrylic cap-stock for lasting fade protection. The deeply textured natural design adds to the beauty of a home with accent areas that create a high-end look at a reasonable price point. With a Class A fire rating, CrestWater Cedar Shakes can be used coast to coast. Visit www.stylecrestinc.com/crestwater to learn more. 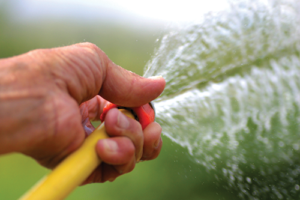 Style Crest is pleased to announce the acquisition of Atlantic Service & Supply, effective June 16, 2015. This acquisition includes the assets of operations in Tyler and Ft. Worth, Texas, along with Lake City and Panama City, Florida. Atlantic’s operations include HVAC installation, skirting installation, deck construction services, and supplying a full range of products for manufactured homes. For current Atlantic customers, Style Crest will continue to service you with the same product mix and services offered today and will continue to operate this business under the Atlantic Service & Supply name as a Style Crest company. Style Crest is excited about adding the knowledge and experience of the Atlantic team to our expanded efforts in growing business in the Texas, Florida, and key Southeast markets. Over the years, Atlantic Service & Supply has continued to bring to market valuable products and services to their customers and plans are to use the combined efforts of Style Crest and Atlantic to be able to offer our customers enhanced services. “As a national manufacturer and distributor of products and services for manufactured homes, this latest addition is another key strategic piece that supports our commitment and dedication to the manufactured housing industry.” Bryan Kern, CEO, Style Crest, Inc. stated. “And with the acquisition of Atlantic Service & Supply we see great synergies and opportunities to grow our business in under-served markets. This is a win-win for both Style Crest and Atlantic customers”. 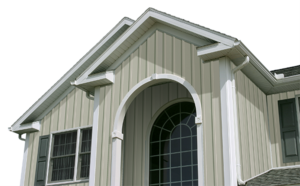 Style Crest Siding has a high-quality recycled content that reduces the product's impact on landfills and the environment. 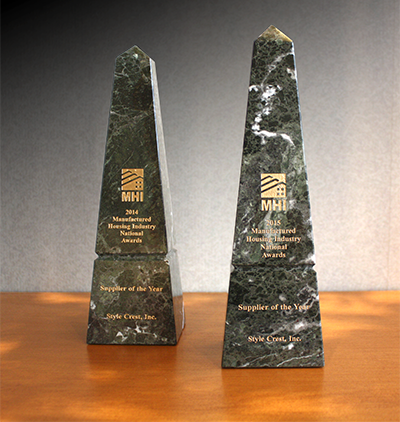 For a second consecutive year, Style Crest® has been awarded MHI Supplier of the Year. 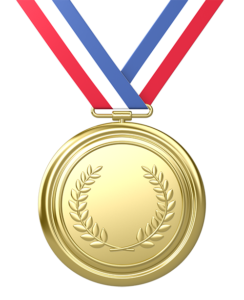 The award was presented during the 2015 Manufactured Housing Institute Congress & Event Expo, held at Paris Hotel and Casino in Las Vegas. Voted on by the members of MHI, Style Crest was recognized for its continued innovation in products and programs, along with its continued support and advancement of the industry. Bryan Kern, CEO, and Bill Vogel, Executive Vice President Sales for Manufactured Housing, accepted the award on behalf of the entire Style Crest organization. Style Crest has continued to show leadership in the industry with innovative products including the complete line of Revolv® Indoor Comfort Products with AccuCharge® Systems designed for mobile home applications, Chocolate and Charcoal Skirting, Premium 13" Skirting, and programs such as Generate Leads For Me and the Revolv® Dealer Program. Style Crest is a manufacturer and distributor of over 4,000 products servicing the Manufactured Housing Industry nationally for over 40 years. This is the fifth time Style Crest has been recognized as MHI Supplier of the Year, previously winning the award in 1996, 1998,1999 and most recently, 2014. 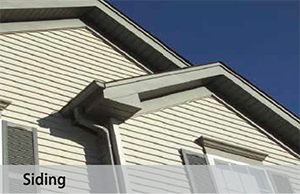 The quality of the installation is just as important as choosing a high quality vinyl siding? 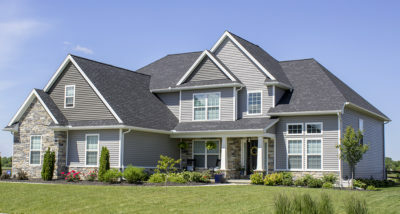 The best quality vinyl siding will live up to it’s true potential of looking great and performing well for years to come when it is installed by a Certified Vinyl Siding Installer. The VSI Certified Installer Program ensures that experienced professionals receive thorough training on proper, industry approved installation techniques. Using a combination of classroom training and written examinations given by a VSI Certified Trainer. All VSI Certified Installers must be re-certified every three years, to ensure they stay abreast of the latest application techniques. Check out the America Sides with Vinyl videos on You Tube. Be sure to look for the VSI logo. 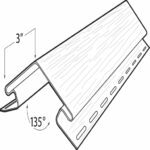 Style Crest has affordable aluminum trim options and offers a color match trim coil for all of our vinyl siding colors and some of our competitor's colors? The complete line of quality aluminum products from ALSCO is available to you from Style Crest. 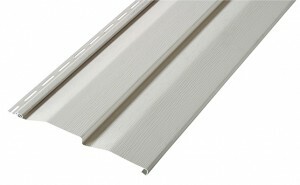 Color match trim coil for all Style Crest vinyl siding colors is available in PVC and most colors in Smooth. 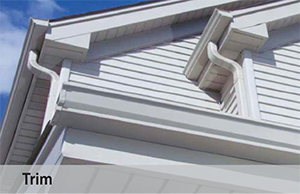 ALSCO is the only trim coil manufacturer with approved color match trim coil for James Hardie ColorPlus Colors and Style Crest can provide these to you on a drop ship basis. ALSCO's Perfect Trim, the industry's most comprehensive trim collection, in 34 of today's most popular designer trim colors, is available from Style Crest by special order. 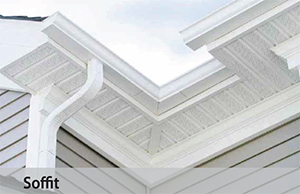 All colors are available in soffit, fascia, trim coil and roof molding and we also have 36 colors available in a complete rainware system called Perfect Trim Plus. 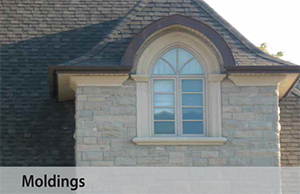 ALSCO is the perfect trim for a truly beautiful home. 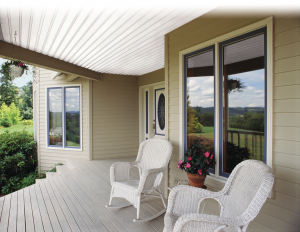 For affordable alternatives in aluminum building products by ALSCO available through Style Crest, contact our Sales Center at 800-846-9599 or your Style Crest Sales Representative today! Certified Revolv® Dealers have successfully completed Revolv® Certification training. 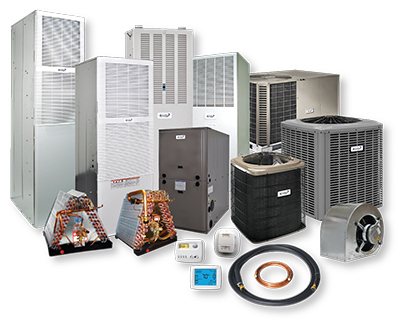 Each dealer listed below is knowledgeable in this product line, including Revolv® Air Conditioners, Furnaces, Heat Pumps, Packaged Systems, Line-sets, Condensers and Coils. All Certified Dealers have been tested in their knowledge of this product brand in order to achieve the “Certified Revolv® Dealer” status. Click here for a list of Certified Revolv ®Dealers. 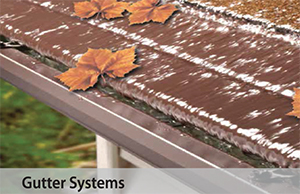 The right accessories provide a supplemental rain screen to a home's water-resistive barrier. Vinyl siding is designed to allow the material underneath it to breathe, which in turn creates a healthier living environment. When properly installed; using the right vinyl accessories provides additional rain screening, reducing the amount of water that reaches the underlying water-resistive barrier and can create curb appeal. 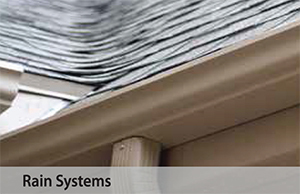 Vinyl Fascia - the trim covering the ends of the roof rafters between the roofing material and the soffit overhang. 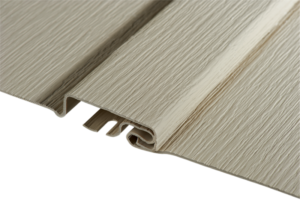 We offer both 6-1/2 inch and 7-3/4 inch widths in our popular white birch color. 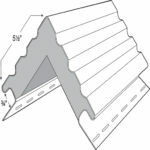 Vinyl Starter Strip - applied level, directly to the surface of the building at the lowest point siding will be installed, is used to secure the first course of siding to the home. Our starter strips are 2-1/2 inches wide by 12 foot- 6inches. Inside and Outside Corners - transition trim used to cover the intersection of two walls. 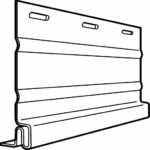 Our inside corner post comes in a length of 10 foot, features a 1-3/8 inches face with a 3/4 inch receiver and is available in a matte finish in 28 of our most popular colors. 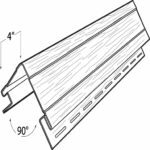 We offer a variety of outside corner posts. 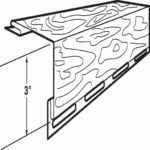 We also have a complete offering of F-Channel, J-Channel, and Finish Trim, including Window Lineals with or without foam inserts. Use Accessories to Increase Curb Appeal! For some great ideas on how to make these functional accessories increase a home's curb appeal check out this curb appeal article from Charlotte Living. 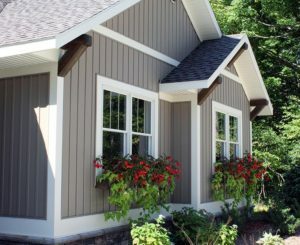 Vinyl siding is the only exterior cladding with a product certification program administered by an independent, accredited quality control agency? VSI Product certification ensures products and colors, meet or exceed industry standards and gives consumers peace of mind. 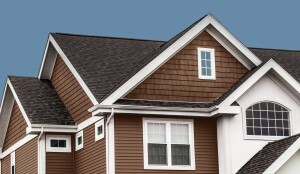 Style Crest Inc. has received VSI Certification on our ProPride Vinyl Siding. Combining durability with affordability, low maintenance and curb appeal, ProPride’s brushed cedar wood grain finish is available in a crisp 4.5" Dutchlap profile in 10 refreshing colors. Large trim kits - 165‘ per kit!